Now QFract is updated for Qt 5 (LGPL/Free). It is distributed under GNU GPL v2. Notice: I put all the plugins I have made. Some of them might be useless, and some of them are not compiled automatically from the source by simply execute make. Edit plugins/Makefile, or modify and use make.sh in the plugin directory to compile them. (for 20110725_1 version) Add "-ffsat-math" option for Windows MinGW compiler (unless some plugins work so slowly). Now QFract uses Boost::thread to threading. Default is 4 threads. You need to rebuild to change the number of threads. Because of some difficulties to calculate progress during long calculation, progress is not shown any more. New colormaps: default-NTSC.map and defaupt-HDTV.map. They are grayscale version of default.map. In the source coe, there are scripts (NTSC.sh and HDTV.sh) converting colormaps to grayscale. cubicsuperper2ray plugin has changed not to divide by the natural involution. Open PNG file in new window. 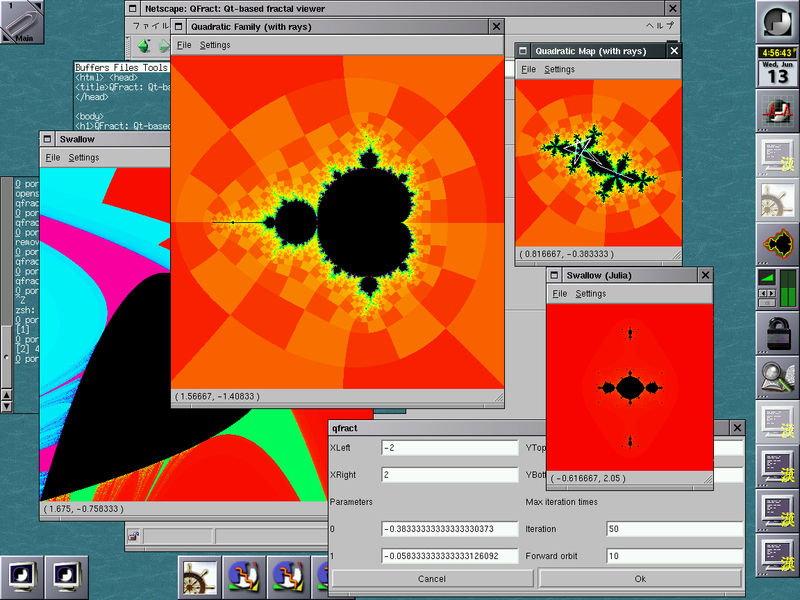 Precise new window size (640x640, 320x320, etc.). Minor bug correction: colormap and function plugins could not be opened via file open dialog for Windows. No difference for other environment from 09/08/04 version. Now QFract is for Qt 4.5. Also added many functionalities. QFract can run natively under Windows and Mac! Static link binaries are distributed. Load saved PNG image (saved by QFract itself). Added new load function plugin dialog. You can choose function plugins from a list of plugins with some descriptions. Default colormap for each plugin. A bit faster drawing loop than before. Don't redraw when the max iteration times for forward orbits is changed. Add plugins for degree 2 rational maps with period 2 superattracting orbit. Add plugins for quadratic maps with period 2 and 3 external rays. Add a plugin for real biquadratic maps with stretching rays. Add a plugin for real cubic maps with stretching rays. Add PLUGIN.jp(how to create plugins). Add plugins for real cubic maps. Add plugins/make.sh (script for compiling plugins). See also makeplugin.sh. Add tricorn and tricornjulia plugins. Initial point of a forward orbit can be different from the mouse pointer. See Point init(Point, int, double) in plugins. Add the plugins for biquadratic maps and degree 2 rational maps with a period 3 superattracting cycle. Colormap is inherited from the parent window. Add scripts to make new colormaps for period 2 and 3.